“We went up into the high tower to see the troops pass over into Virginia.” Mary Anna Henry (1834–1903) wrote this line in her diary on July 16, 1861. 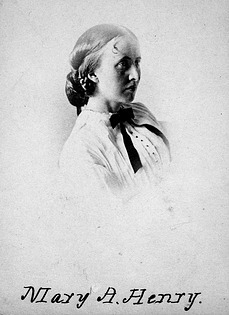 Mary Henry was the daughter of Joseph Henry, the first Secretary of the Smithsonian Institution. She lived with her family in the Smithsonian Institution Building, or “Castle” on the National Mall in Washington, DC, from 1855 to 1878. During the Civil War, although DC remained the capital of the Union, from the Castle Mary could see the Confederate States of America. On the border between two countries at war, Mary wrote about events in the city over the course of the entire Civil War. Born in Princeton, New Jersey, in 1834, Mary Henry was the second child of Professor Joseph Henry and his wife, Harriet. She had one older brother, William, and two younger sisters, Helen and Caroline. Upon his appointment as Secretary in 1846, Joseph Henry was promised accommodations. After the Smithsonian Institution Building was completed in 1855, a suite of eight rooms was constructed on the second floor of the East Wing, and the Henry family moved in. They remained in these apartments until Joseph Henry died in 1878. As a Washington DC resident, Mary Henry had an insider’s view of the country, both on the path towards and during the Civil War. Her diaries (see excerpts below) detail events and the mood in the city. The entries cover the entire span of the war, from watching debates in Congress before the Southern states seceded to the death of President Lincoln. She records news reports of major battles and personal observations of troop movements and preparations. Living in Washington also allowed Mary to become acquainted with social, political, and military leaders. In the Castle, the Henrys entertained generals and their wives, and heard firsthand accounts of the war’s progress. Mary met and observed soldiers in the streets of the city and the make-shift hospitals, which had been set up with the help and expertise of her close friend Dorothea Dix. Some of her friends even fought, or had family who fought, for the Union. The diaries also contain descriptions of events at the Smithsonian Institution. Joseph Henry welcomed many scientists and scholars into the Castle, and Mary was often present for these visits and discussions. She also recorded the fire in the Castle in January of 1865, which destroyed many original Joseph Henry and James Smithson records. Although she left the Castle in 1878, for the remainder of her life Mary continued to be a prominent citizen of Washington, promoting the significance of her father's work as a scientist. While on an annual trip with her sister to Europe, Mary died in Seville, Spain, on April 10, 1903, at the age of 69. Dorman, Kathleen W. “‘Interruptions and Embarrassments’: The Smithsonian Institution during the Civil War,” Smithsonian Institution Archives. “Joseph Henry: A Life in Science”. “The Civil War at the Smithsonian Institution”, National Portrait Gallery. Smithsonian Institution Building or Castle. “Lincoln: Smithsonian Education Online Conference”. DesRochers, Aly. “Wartime in Washington—Mary Henry on the First Manassas.” The Bigger Picture (blog), Smithsonian Institution Archives, July 21, 2011. “Civil War Leaders: Dorothea Dix, Smithsonian@Civil War”. Fire in the Castle, January 24, 1865 – for further information about the 1865 fire in the Smithsonian Castle visit these blogs, Smokin’ Smithsonian, the Burning of the Smithsonian, and artifacts lost in the fire, as well as The Washington Post article on Indian portraits lost in the fire by Michael Ruane.